Strictly speaking, I draw and design and had never thought of doing stained glass. My partner, Kevin Jinbo, and I were building contractors specializing in the decorative arts and began playing with incorporating lit glass in structures (bars, piers, etc.) when we both came up with the idea of lighting a column internally. We got very excited about the idea and had a client who was game, so we began designing a structural square column with four pieces of glass where the column's panels would typically be. We were planning to put decorative metal over the glass panels but the logistics of that much decorative metal in terms of cost, availability of unique designs, finishing, as well as other limitations got us on the track of using actual stained glass designs. They were lighter, they were basically windows so they didn't need weatherproof finishes, and were more adaptable to varying architectural styles. There was the one nagging problem in that we knew nothing about glasswork and when we began getting prices on finished glasswork we realized it was time for a stained glass class. My partner Kevin enrolled, and after one or two classes we began working. I used to build recording studios and had probably soldered enough lead to circle the globe twice, so it wasn't hard for me to get the hang of leading glass. To make a long story even longer, the columns were such a success in terms of their unique beauty, client satisfaction and popular demand that we decided to go into business fabricating and selling these columns. To our surprise no one had ever filed a patent on a structural internally-lit glass column before. There were lit columns that were glass but weren't structural, lit structural columns that weren't glass, and every other combination but ours, so we filed our application and off we went. Our first pattern was painstakingly hand-drawn and we immediately saw the value of having some type of drawing program especially suited to glass work. While buying materials at a local glass supplier I asked if they had any suggestions and they immediately recommended Glass Eye 2000. I got online and ordered the Professional Plus Edition when I found out I could use real glass images to color my patterns. In terms of clients this is an absolute must, as I spend more time with the clients on glass color than anything else. To be able to pull out a laptop with the design loaded and have the client pick out their own colors with manufacturer's numbers adds the type of customization I like to provide clients and believe is essential to good customer service. It also removes liability in that the client is picking scans of the actual glass so they become responsible for their choices. When they pick the glass I then pull out my Spectrum sample box and they can see what the actual glass looks like. If they like that we're off. The instant glass coloring is why I initially bought the program, but when I really started getting into it there was nothing about the program I didn't like. I systematically went through the manual in a day and was turning out designs the following day. There are so many drawing programs out there that are way over-engineered due to the number of applications they are designed for. With Glass Eye 2000 I got something specifically engineered for glass design only so I wasn't wasting time wading through bells and whistles I didn't need. Having said that I would also add that there is nothing Glass Eye 2000 can't do in terms of 2D design. The reason I offered the design I did (I've done hundreds of light column designs) was to illustrate its ability to construct very elaborate classical designs without an art school degree. I adapted this piece from an illuminated manuscript, combining two small panels into one to give me the height necessary for the column. At first I scanned the images and sized them in Photoshop and imported the composite image into Glass Eye 2000. I put that image into the background and drew my design on top of it. Once I had drawn the rough outline I began fine tuning the design. The approach I take for a classical piece is to draw it as an outline illustration and then find a way to realize it in glass. In other words, I don't try to change the design to make it more "glass-friendly" but add whatever break lines are necessary to make it possible to construct. The number of panels I had to make and the time and expense of cutting it led me to take advantage of the software's DXF output feature to send the design to a CNC waterjet cutter where I had twelve panels cut out in a day. Waterjets aren't practical for one-offs because the big expense is the setup time, but if you're doing several copies of a design it can be a time and money saver. Because Glass Eye 2000 is such a powerful design tool I've used it for waterjet cutouts of metal designs as well. Below is a design for a decorative music stand for a Steinway Boston piano. It was conceived and designed with Glass Eye 2000 and cut out of solid brass plate on a waterjet. Selling an artwork before making it requires an impressive illustration, and Glass Eye 2000 gives you that. If you are just starting out you can create a design portfolio with credible illustrations that can land you those hard-to-get initial jobs to get you going in the business. 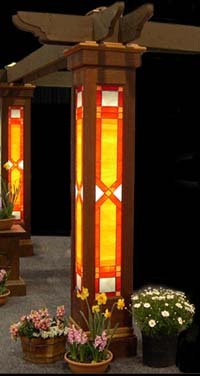 Kevin Jinbo and I are the owners of Carter & Wheeler, manufacturers of the patent-pending structural stained glass light column, and can be contacted at tim@speedymail.org.